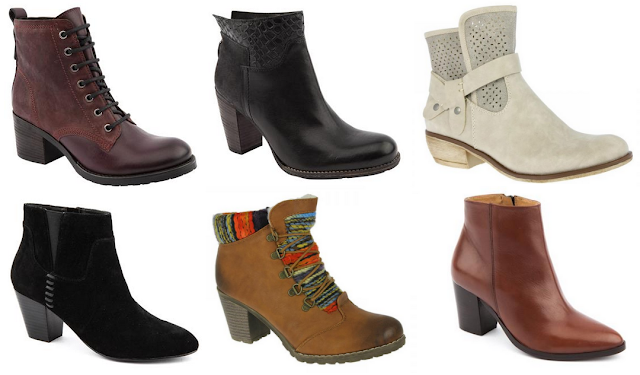 I'm a big boots fan, especially when it's starting to get colder and there's a bunch of new styles coming out. It gets me all excited for winter, and this year I want to invest in a couple of pairs of really good ones! I'm talking real leather and quality craftsmanship, that will not only last all winter but for at least a couple of long years! Jones Bootmaker is a brand I've been aware of but never really looked into, but having a look online I saw they had a lovely range of affordable Leather Ankle Boots I could invest in. I'm a big fan of the Ora Ankle Boots (top left) and the Oriel Ankle Boots (top middle) for practicality and versatility. The heel isn't too high, and the designs are timeless suiting so many outfits off the top of my head. I also found myself on Shoetique's Rieker Boots range, and I've fallen for the White ones hard being so different to so many I've seen online recently and the colourful tan boots would be perfect for casual outfits on those colder days out. It's so hard to pick one pair when there's so many great choices out there, but I'm definitely becoming a sucker for the first two on my wishlist today and there's a good chance I'll be investing in some soon! What ones are your favourite on my wishlist today? These all are so lovely! I love the first! So nice!